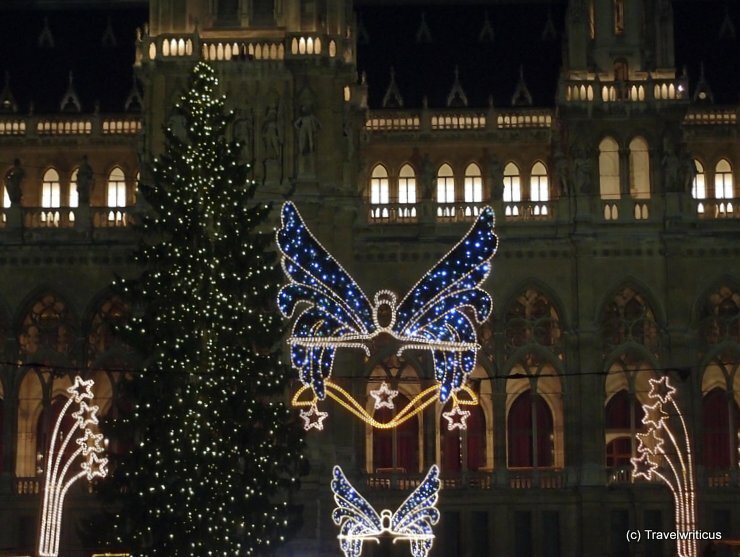 On November 18th, I started a series of blog posts featuring the Christmas markets of Vienna. In the last six weeks I tried to visit a lot of markets situated in this big city. Well, its time to put down a final blog post answering the question: Which Christmas markets are worth a visit? 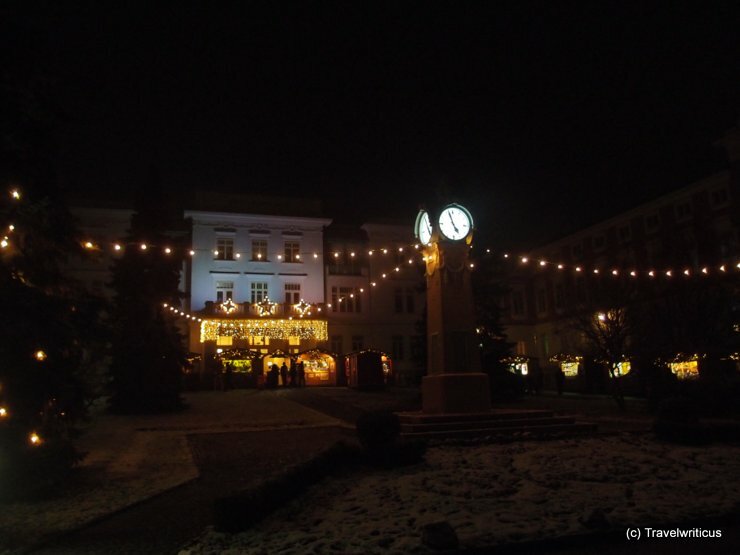 Right behind the main entrance of the hospital Otto-Wagner-Spital there is a small Christmas market located. As the hospital is built in the style of Art Nouveau this market is a gem for people who are interested in this special period of architecture. The Wintermarkt (Winter market) isn’t really a Christmas market and actually its name doesn’t claim to be one. Though I paid a visit on my Christmas market tour through Vienna as the location is very special. The market is located at the entrance area of the Wurstelprater, a fun mile of Vienna. 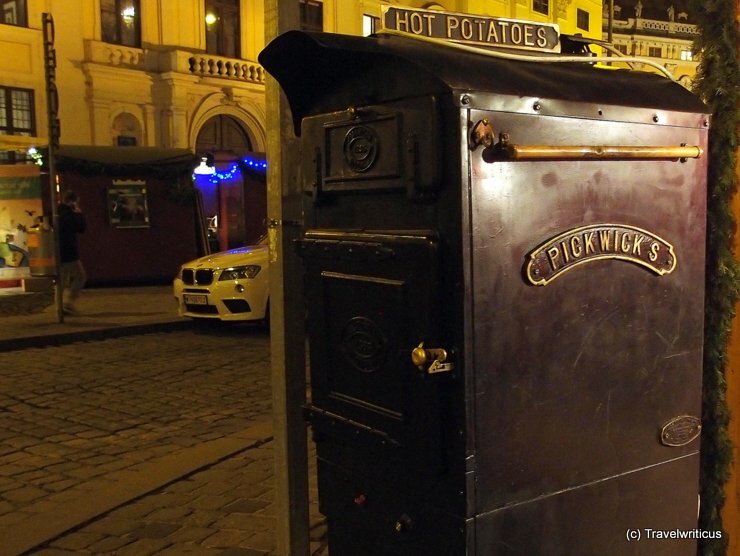 On my walks along the Christmas markets of Vienna I came across ovens labeled with the company sign Pickwick’s for several times. I love the style of the ovens and the sound of the company’s name. Does anyone know where this company is from and did you see this kind of ovens at the Christmas market of your place as well? At this weekend I discovered an Christmas market in the basement of an amazing building in the middle of Vienna. The building was designed by Adolph Loos and is a gem for all people interested in architecture. The market (which is opened on weekends only) is focused on design and surprised me with two products: Phone covers made of water-resistant paper and travel reports as graphic novel! 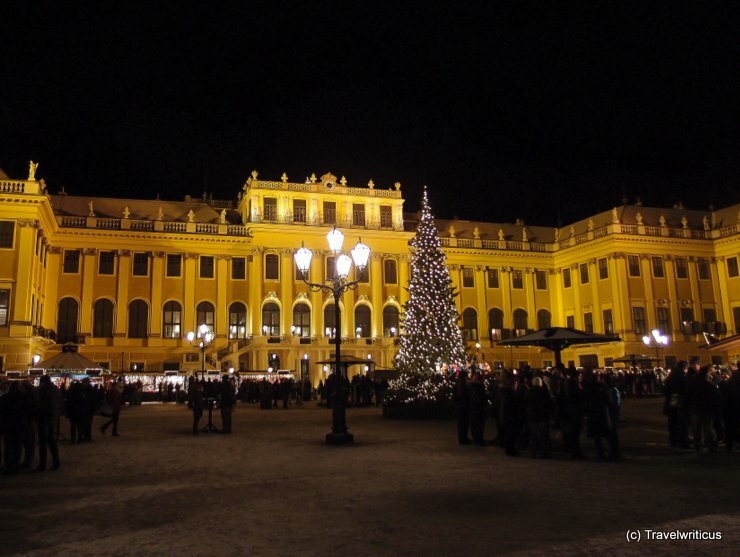 The Kultur- und Weihnachtsmarkt Schloss Schönbrunn is situated at the Ehrenhof (Cour d’honneur) of Schloss Schönbrunn (Schonbrunn Palace). 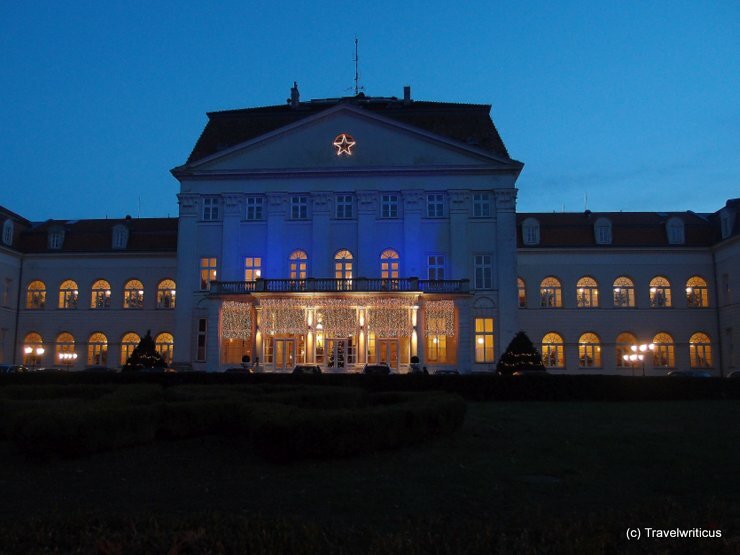 I was especially impressed by the splendid setting, the lively concerts on a stage in the middle of the Christmas market and the offered goods which varied from Hungarian shadow theatres made of paper to incense smokers made at the Erzgebirge (Ore Mountains) of Germany. 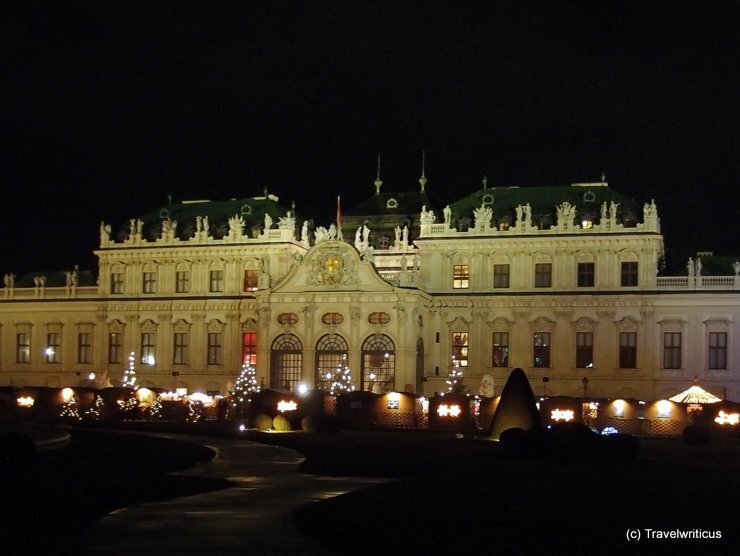 The Weihnachtsdorf Schloss Belvedere is situated at the southern side of Schloss Belvedere (Belvedere Palace). I loved it for the great setting and the stars located at the pond in front of it. The offered goods were the general stuff. 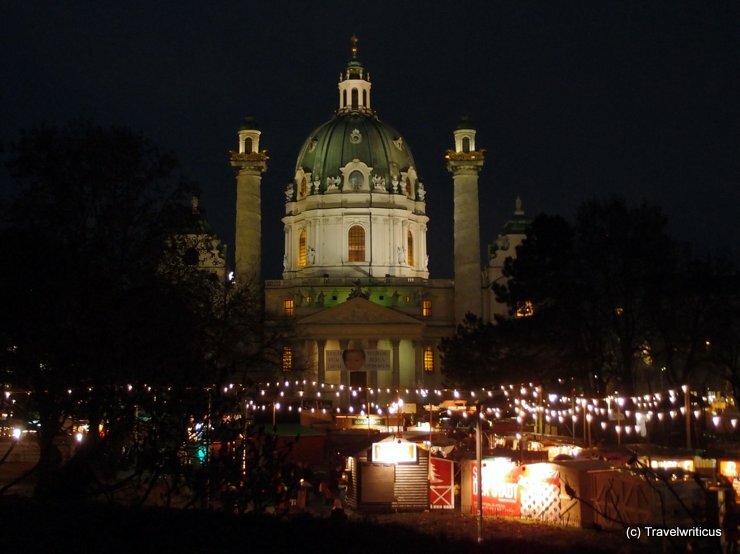 I’d recommend this Christmas market especially for enjoying this view in front of a Baroque palace which offers a great collection of Austrian paintings (e.g. Klimt, Schiele) at the State Gallery inside. The Adventmarkt at the Karlskirche is a very special one. Nearly every hut offers products made by artists or craftsmen. It was much fun to walk along the stands listening to the shopkeepers hammering and polishing their items. 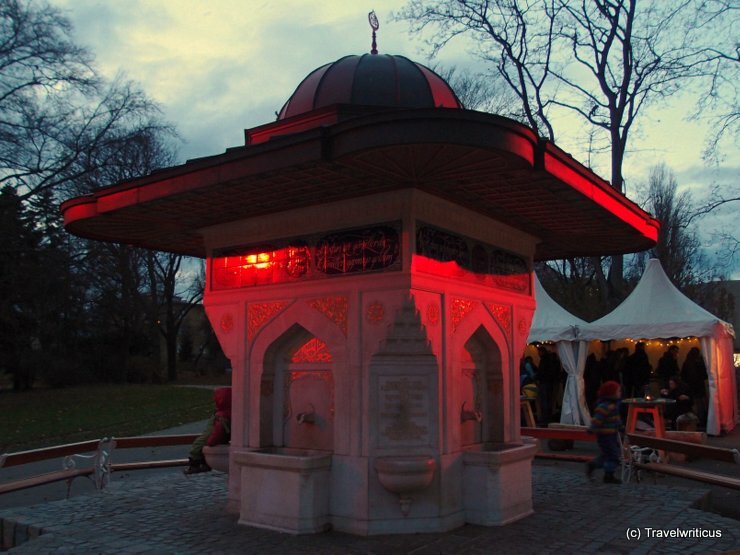 One of the lesser known Christmas markets of Vienna is that one at the Türkenschanzpark. The specialty of this market is the history of the place and this fountain depicted above. During the siege of Vienna in 1683 there were a lot Ottoman entrenchments ([german] Türkische Schanzen) right at these place. 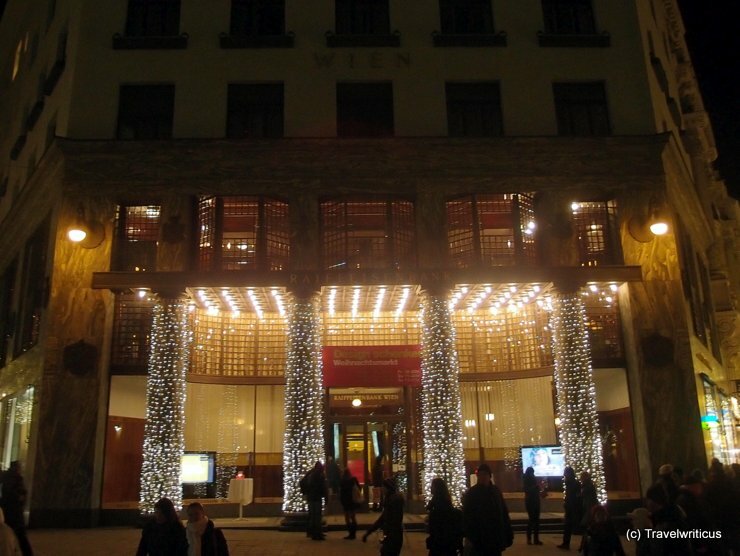 At the rear of the Austria Trend Hotel Schloss Wilhelminenberg I discovered a small Weihnachtsmarkt (Christmas market) with two details which made the place remarkable for me. 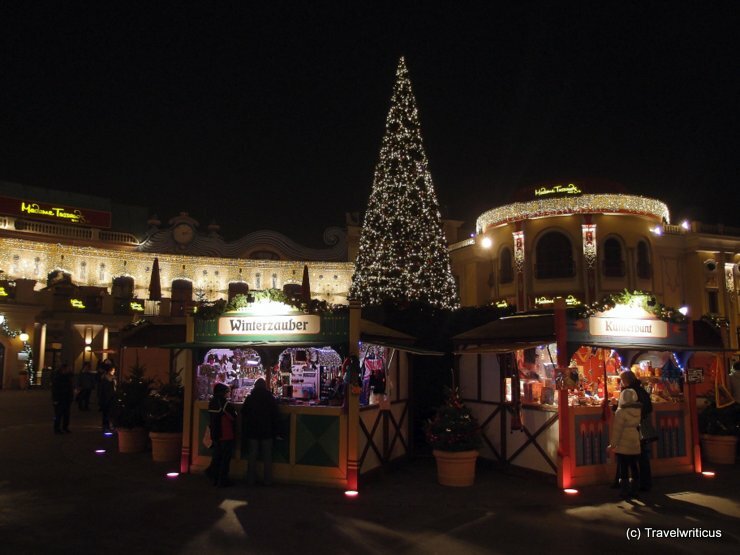 The Christmas market located at one of the hills north-west of the city offers a fine view of Vienna’s outskirts. Besides that children have much fun skating on an ice rink situated at this place high over Vienna.